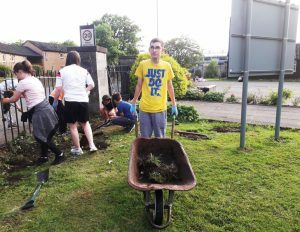 Members of 284th Glasgow Company along with members of 67th Glasgow Girls’ Brigade Company have been busy working on an outdoor project. The project has been split into three parts including creating a Vegetable Garden, building a Bee Hotel and tidying up the Church grounds. The young people have also been learning more about bees, including the vital role they play in nature, about how they are in decline and what can be done about all this. The Company has teamed up with The Royal Horticultural Society to take part in their “I Can Grow” project. The aims of the project are to empower young people to garden for the purpose they feel is important and to help them understand the role that plants play in our lives. During the project, each week the young people have been splitting into three groups, with each spending some time tending the growing beds and potatoes, helping clear the grounds and plant flowers and do some work on the Bee Hotel.